When you pull those cookies out of the oven, the first thing you probably want to do is grab one off the pan and eat it. Unfortunately, one of two things is going to happen if you do that. First, you’re going to wish you hadn't just burned your tongue. Second, the cookie may fall apart in your hands because it’s still so soft from the heat of the oven. The solution? Carefully remove the cookies to a cooling rack for a few minutes before enjoying. What are Cookie Cooling Racks? Cookie cooling racks are also called wire cooling racks and wire baking racks. All of the terms are interchangeable. They’re essentially large wire racks with legs or lifts. They sit anywhere from a quarter of an inch to half an inch away from the surface of your counter, and some are even adjustable to get more airflow when it’s required. They come in all shapes and sizes from circular racks to square choices to selections that stack. There are actually a number of different reasons you need a cooling rack for cookies and all of your baked goods. Cooling racks hold your cookies away from the surface, and that means air can circulate around them, reaching all sides of it. That means that it won’t over-bake if left on the pan itself. What’s more, though, is that it can also prevent condensation from forming on your design cookies, which might make them too soft or mushy. 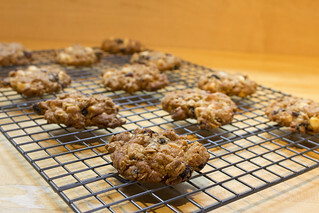 There are almost as many cooling racks as there are cookie recipes floating around. The size you need depends on exactly how you might use it. Keep in mind that almost all of the desserts you cook may actually need a cooling rack, so even if you buy it for the cookies, you’re probably going to use it for something else, too. Cookies themselves don’t need a particular size. You can stack several cookies on a pretty small rack. If you tend to bake quite a few cookies at any given time, though, it’s best to have a very large rack or at least a stackable choice. Your other option is to have more than one rack at a time. You can get a cooling rack at almost any store, including big discount retailers like Walmart and Target. While you’re going to have access to a better supply at a kitchen goods store, if you’re just looking for something fairly basic, you can shop anywhere. Even party-based companies like Pampered Chef offer a good supply of cooling racks to meet your needs. Don’t forget that cookie cooling racks are actually pretty multifunctional. You can put hot pans on them while you’re moving things around in the kitchen, and you can even place wet veggies or fruits on them while they dry. If you plan to frost cookies or cakes, it’s the perfect place to put iced birthday cookies while the frosting hardens as well. « Halloween Cookie Giveaway - 2 Winners!